When it comes to mobile banking, the only thing more important than providing customers with a first-rate app is making sure that it has first-rate security as well. Launched in 2014, FirstBank’s mobile banking app has been “incredibly well received” by customers, says bank COO Jim Reuter. “Adding one-touch authentication will further enhance what is already one of the most progressive, easy-to-use mobile banking technologies on the market.” FirstBank plans to add biometric authentication functionality to its Android-based mobile app soon. Founded in 2008 and headquartered in Stellenbosch, South Africa, Entersekt demonstrated its transaction authentication and mobile app security solutions at FinDEVr Silicon Valley 2014 as part of its presentation, “Securing Mobile Applications through Transport Layer Diversity.” In September, Entersekt announced a new reseller agreement with Minneapolis-based security firm, Blue Bay Technologies. And in August, Entersekt forged a partnership with Finovate alum Backbase that will make Entersekt’s authentication solutions available via Backbase’s Open Banking Marketplace. Last week I received new credit cards from US Bank and Capital One, both containing microchips to support EMV terminals, the global standard finally rolling out in the United States over the next few years. Given the world’s obsession with tech, it’s a good time for issuers to toot their own horns a bit. The Capital One card mailer did a good job doing just that. The entire mailing package was built to highligh the changes. The copywriting was excellent and there were multiple avenues for interested consumers to read more about the new technology. In addition to the expected copy on the front of the card mailer (Fig 1 below), there was an FAQ on the back (Fig 2 below), and a brochure included in the package (not pictured). Capital One built an explainer page on its website, but unlike US Bank (below), the URL is buried in FAQs on the back of the mailer. US Bank, on the other hand, took a less-comprehensive approach with the mailer, but delivered much more on its website. The bank shoehorned an EMV explanation box onto the usual card mailer (Fig 3 below), and referred questions to an excellent explainer page on its website (Fig 4). Website visitors receive thorough explanations, how-to graphics, and a short video showing how to insert a chip card in a reader. NEW! Enhanced security with chip technology. Your new card now features greater fraud protection—built right in. Whenever the chip card is used with a chip-enabled terminal, a unique one-time code is created for the purchase to be approved. This is nearly impossible for counterfeit cards to duplicate, so you can shop with confidence. Plus, with more merchants around the world installing chip-enabled terminals every day, you have a more secure way to pay—wherever you go. That all could have been covered with one or two bullet points (for example, see Fig 1). When you visit a retailer with new chip-reader technology, you may need to insert the chip-end of the card into the reader instead of swiping. Most likely the clerk will show you how to do it, but if you would like to see it now, watch a one-minute video at mybank.com/using-new-chip-card. If the retailer still has older equipment, just swipe your card as usual. There are no changes as to how you use our card online or through your mobile phone. No matter what technology the retailer is using, when using a US Bank card, you are always protected by our 100% fraud guarantee. Click on any of the above images for a more detailed view. Nowhere does either bank mention whether it’s a debit card or credit card. For customers with both that should be clarified. Capital One moved the account number to the back, making for a very clean look. 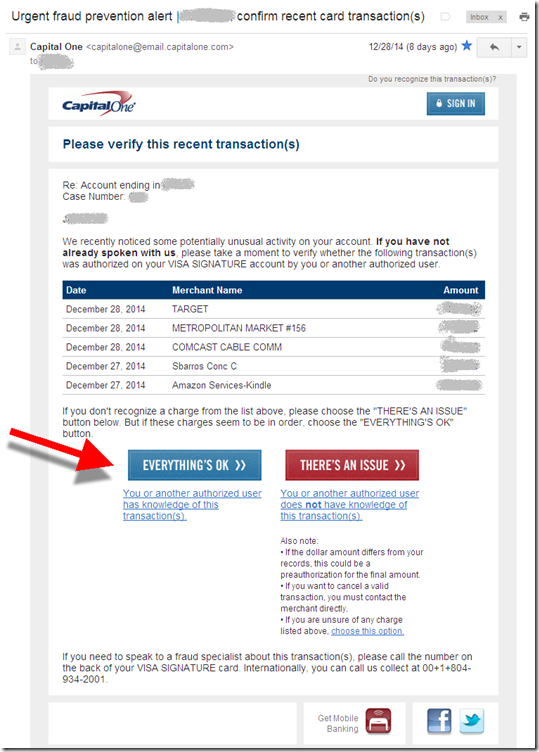 It’s also much easier to read when you manually input the card number into a website. I know it’s a pain from a support standpoint and probably has a horrible ROI, but I would sure appreciate an email address to ask specific questions. I have a “gold card” for a reason, an easy way to interact with customer service seems like a reasonable expectation. I recently received a new card from Simple, and surprisingly, it is not chip-enabled. That sure doesn’t fit with its high-tech positioning. Why is my US Bank “Visa Gold Card” now in 50 shades of blue (Fig 3, top left)? I like the new design, but seems like a name change is in order. We are always on the lookout for digital fee-income opportunities. And if I got a nickel for every one of them I’ve ever found … I’d have about a buck at this point. Fees in U.S. online banking are rarer than the (not-so) mythical fintech unicorn. And mobile banking fees are pretty much non-existent outside a few remote deposit fees (see previous post). But last week BillGuard demonstrated a promising new avenue for incremental fee income: Integrated mobile identity-theft alerts, resolution and insurance (see inset). 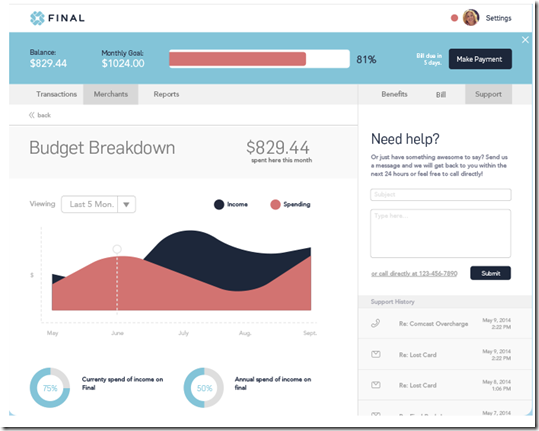 Actual credit report access is not included, but BillGuard says that it is coming soon. The service is mobile only, and the company currently has no plans to add it to the desktop version. The credit and fraud monitoring is powered by CSIdentity (CSID), an Austin-based firm that says it powers 80% of the retail identity-theft-protection industry. The company, founded in 2006, has raised $36 million in equity (mostly in 2010) and $6 million in debt. The service is value-priced, at $2.99/mo for the single bureau Pro version or $6.99/mo for the 3-bureau Ultimate. In comparison, most ID-protection services are in the $15 to $20/mo range (Experian charges $15.95/mo for a private-labeled version called ProtectMyID with BillGuard). 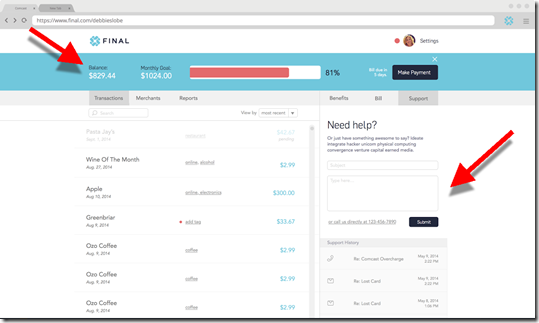 Founder Yaron Samid says BillGuard provides essentially the same third-party monitoring as the $30/mo offering from Lifelock for one-fourth the cost. And with BillGuard, users get credit/debit card transaction monitoring (powered by Yodlee) for free. 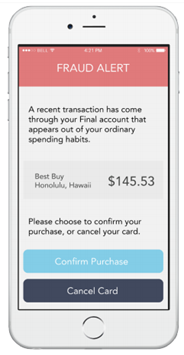 Cardholders are already looking to their smartphones to stay informed of problems in real-time (case in point, BofA just integrated fraud alerts into its mobile app). So it makes sense to deliver extra protections services in-app. Although there is stiff competition from free ad-supported versions such as Credit Karma, we believe integrated protection services are a logical fee-based upgrade for mobile banking customers. Note: It was from a breach in November 2013. I assume I received the alert this week since I was a new customer. Card reissues after a data breach, or lost/stolen situation, are annoying for cardholders. But it’s even worse for the issuer who has to pay for a new card, hound the customer to activate it, handle customer-service calls, and then risk losing recurring revenues from now-broken automated pre-authorized charges. 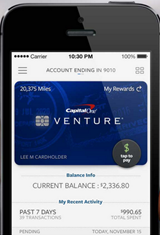 So kudos to Capital One for taking an important step in solving this problem. 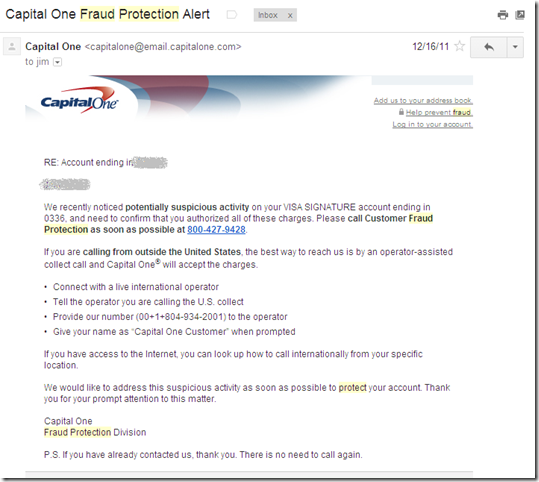 Earlier this week I received a new card and number from Capital One, presumably because my card had been involved in a breach. I am not aware of any unauthorized attempts to use it. In a followup email this morning, the giant issuer reminded me to activate the new card. That’s a fairly typical technique these days. But the help didn’t end there. The bank provided a list of likely merchants where I may need to update card info to avoid the charge being denied (see screenshot below). That’s great customer service and something I’ve not seen before. But of course I want more. The list I received was primarily merchants where I made one-off payments. Who has a recurring charge with United Airlines? So it needs to be scrubbed better. And it would help to include the most recent charge amount and number of charges to help identify actual recurring charges. And ultimately, it would be even better if the process was semi-automatic. Let me respond to the email with a simple yes/no response for each merchant indicating if I wanted them to continue the automatic billing under the new card number. Or at least provide links to reduce the friction of the task. But all-in-all, a welcome improvement.